1. Why a guitar store (or music retailer of any kind i.e. Sam Ash) as opposed to a pawn shop, department store or online? A music retailer is more likely to know their product and have some quality control. This means you are less likely to get a dud that needs to be returned. Stay away from department stores all together, you’ll never find a decent guitar at a department store. If you have a friend or family member who knows about guitars and can help, a pawn shop or online is okay, but could be a headache if you have a problem. 2. Why Yamaha? It’s simple – their quality control is second to none at any price level. As for the C40, it’s a full size nylon string classical acoustic for about $130. 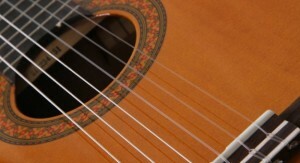 Nylon strings hold less tension and are softer than steel strings making them easier to play for beginners. If you really want a steel string acoustic or electric guitar then go ahead and get one (it won’t be that much harder to play). Yamaha makes great steel string acoustics. Yamaha electric guitars don’t seem to very popular therefore you don’t see too many of them in shops. Ibanez, Epiphone and Schecter make some good entry level electrics. Of course Gibson and Fender still make excellent electrics but they cost a bit more. Hey, if you’ve got the money, go for it! 3. Buy the correct size. If you are buying for a child you may want to consider a half size or 7/8 size guitar. Yamaha has offerings of classical guitars in both of these sizes. A sales person at a reputable music store should be able to help in fitting your child with the right size guitar. When it comes to buying an instrument you cannot skimp on quality! The good news is, a guitar of acceptable quality should be attainable for less than $200. That’s pretty cheap in the world of musical instruments. Finally, after you make that purchase, find a good teacher (like me) and practice every day!